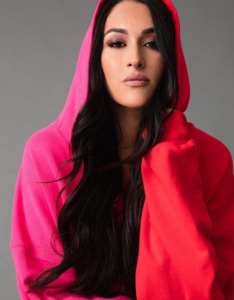 Stephanie Nicole Garcia-Colace (born November 21, 1983) is an American professional wrestler, model and actress signed to WWE under the ring name Nikki Bella , where she performs on the Raw brand. In June 2007, Bella signed with World Wrestling Entertainment (WWE), and was assigned to developmental territory Florida Championship Wrestling(FCW) alongside her twin sister Brie Bella, forming the duo The Bella Twins. She made her debut on SmackDown in November 2008. Bella is a two-time WWE Divas Champion. Bella ranked No. 1 in Pro Wrestling Illustrated‘s Female 50 in November 2015, and was named Diva of the Year by Rolling Stone in December 2015. She also won the award for Choice Female Athlete alongside her sister at the Teen Choice Awards in 2016. Born sixteen minutes before her twin sister, Brianna, to parents Jon Garcia and Kathy Colace, Garcia-Colace was born in San Diego, California and raised on a farm in Scottsdale, Arizona. She is of Mexican and Italian descent. Keen soccer enthusiasts, she along with her twin sister played for the Scottsdale club in elementary school. She graduated from Chaparral High School in 2002. She then returned to San Diego for college where she played soccer for Grossmont College, but relocated to Los Angeles a year later, where she worked as a waitress at the Mondrian Hotel while trying to find an agent.